Despite its name, the Hand RearingAbyssinian Ground Hornbill Bucorvus abyssinicus ranges widely over most of central Africa from Gambia in the east, to Ethiopia in the west and extending south to Kenya and Uganda. It is the largest of the hornbills spending most of its day on the ground hunting for small mammals, reptiles and insects, returning to trees only for the purpose of roosting at night. Unlike other hornbills the pair do not seal the entrance of their nest cavity. Even so, the female rarely leaves the nest throughout incubation and the male supplies food while watching over the nest. Two eggs are laid four to five days apart. Incubation begins with the first egg, giving little chance for the second hatchling to survive. The Paignton pair of hornbills are kept in an aviary comprising an outside viewing area measuring 4 x 6 x 2m. high, with off-show inside quarters 4 x 6 x 3m. high. During early 1993 two nest boxes were placed in the house, one of which, a tunnel type, was placed on the floor and the other, of a more conventional shape was fixed at a height of 2m. Although interest was shown in both boxes the higher one was preferred. Dried peat was spread in the box while dried leaves and twigs were scattered for nest building. Eggs laid throughout 1993 were always broken and so on 25th January this year two eggs were taken for artificial incubation. The female had been sitting for eight days, both eggs were found to be fertile and were placed under a broody bantam. On day 36 they were transferred to a still air incubator set at 39.5° centigrade. 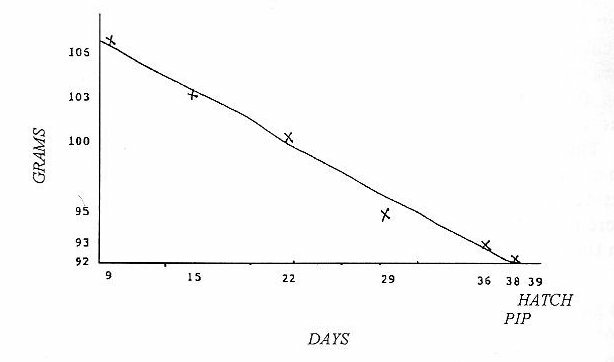 The smaller of the two eggs had begun to lose weight excessively by day 33, and despite an increase in humidity, a 20% weight loss had occurred by day 38. The chick was assisted from the egg on day 40, but unfortunately remained weak until its death at 5 days. A post mortem examination revealed a diseased liver. The bigger egg pipped on day 38 and, hatched on day 39 with only a 13% weight loss. The chick's navel was dabbed with an antiseptic. After being left in the incubator overnight it was moved to a brooder set at 35° centigrade. Being blind, naked and helpless the chick was confined in a small tissue-lined tub. At first the task of persuading the chick to feed proved difficult, however learning was rapid and it soon settled down to a regular feeding routine. The food consisted of finely chopped chick and mouse muscle seven times daily. After a few days, soaked Diet A (Mazuri Zoo Foods) was added once daily with a sprinkling of SA37 and much bone meal. Soon after hatching, the chick's skin became dry and flaky. Rather than risking a fungal infection through increased brooder humidity, petroleum jelly was rubbed onto the chick's skin once daily until the pin feathers were coming through. This worked well and further prevented the faeces sticking to the chick's rear end. 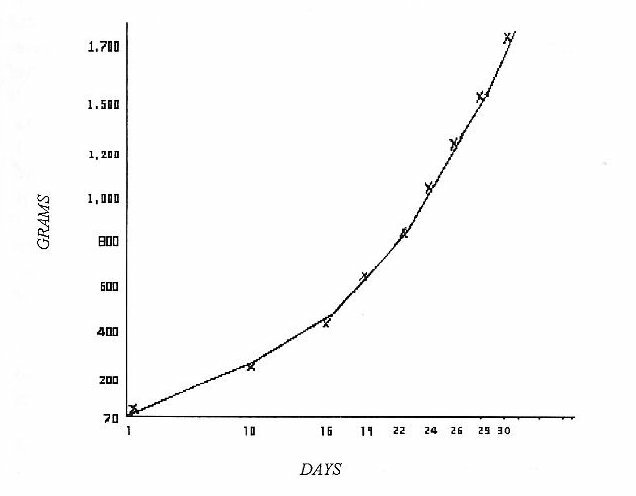 The temperature of the brooder was reduced by 2.5° on days 12, 20, 24 and 30. Pin feathers were showing and the chick's eyes began to open by the 11th day. Over the next 2 - 3 days, as the eyes opened fully, it became very vocal at feeding times. By day 24, whole mice were taken and the chick was moved to a larger plastic box. To prevent leg splaying, cardboard egg trays were placed under clean wood shavings. By day 65 when feeding had been reduced to 3 times daily the chick was standing well, but still unsteady when walking. From that date it progressed very quickly and by day 80 was walking, running, learning to fly and was exercised in the grounds mornings and evenings. During February the adult hen laid a second clutch which she sat for the full 39 days, unfortunately both eggs disappeared. At the time of writing (May 1994) a third clutch has now been removed for artificial incubation.